For the first time in more than 10 years, the always-exciting DCI Southwestern Championship will be hosted outside of the Alamodome due to an unanticipated scheduling conflict with the facility. 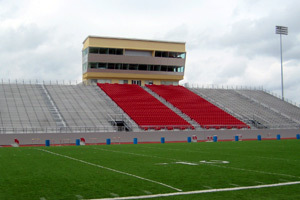 Taking place at the Judson Independent School District's D.W. Rutledge Stadium (Converse, TX), the 2010 event will be split over two days of competition on Saturday, July 24 and Sunday, July 25. Featuring: Carolina Crown, The Cadets, Bluecoats, The Cavaliers, Madison Scouts, Crossmen, Spirit, Boston Crusaders, Colts, Teal Sound, Revolution. Also part of the 2010 DCI Southwestern events will be the Individual & Ensemble Competition for World Class corps which has historically been scheduled for the week of the DCI World Championships. To allow all corps the opportunity to participate, performers will be split over two-day days coinciding with the Southwestern events. The venue for the Individual & Ensemble Competition is still to be confirmed.